CCW: From pause to play? In my preceding post, I posed the question: has anything really changed since last year's difficulties in the UN Convention on Certain Conventional Weapons (CCW)'s efforts to negotiate a protocol on cluster munitions in the wake of agreement by 107 states in Dublin in May on a Convention on Cluster Munitions (CCM) that comprehensively prohibits the weapon? As the CCW Group of Governmental Experts meeting this week approaches its end, the answer looks like 'No'. As foreshadowed, the incoming GGE Chair, Argentina, has focused his efforts on informal consultations at the bilateral and small group level, and there have been few meetings in Plenary, except for an hour on Monday morning and a few minutes yesterday. In each case Argentina distributed "elements for discussion papers". Monday's paper contained textual options on general "prohibitions and restrictions" for a putative agreement, "storage / and destruction" and "transfers". On Wednesday morning the Chair's second discussion paper was circulated, this time on "Protection of civilians, the civilian population and civilian objects" - previously the purview of the Japanese Friend of the Chair on these issues, who has now left. Where does this leave us? Pretty much where we were in November, in my view. The Chair's "elements for discussion" do not differ significantly from what was put on the table by the previous Chair, Ambassador Wigotski of Denmark, in November, and which was unacceptable then to a significant proportion of the CCW's membership . Nor are there really any signs of significant shifts in position since: if anything, the more issues of ratification and practical implementation loom for CCM signing countries, the less keen they will be on weaker restrictions being agreed in the CCW. Russia has made noises that it is now willing to go along with agreeing a protocol in principle, but really this confirms the hunch most operated on previously. The US has reiterated its position, and unlike the other major users and possessors of cluster munitions outside the CCM, has explained in clear terms what the implications of its proposals (as taken up in the Wigotski draft and new elements papers) would have for its national arsenal. But it is unclear whether there actually is anyone at a senior policy level to give them further instructions right now in Washington D.C. with the change in administration. The International Committee of the Red Cross (ICRC) perhaps put it best. The ICRC has noted its surprise to the Chair that what is in effect the Wigotski package is still on the table since it is hard to imagine it being either effective or agreed upon. At best, the package is a menu of things countries might do, and would have the effect of legitimising for decades a weapon type that the majority of the international community have now specifically prohibited. The ICRC (again) urged a very different approach: a comprehensive transfer ban on cluster munitions and a prohibition on use of the weapon in populated areas - as has been argued previously on this blog, these would have real humanitarian impact. It is a very peculiar situation. As several colleagues (who shall remain nameless) put it to me; if the CCW were working on, say, torture issues rather than cluster munitions, it would never be acceptable to negotiate a package of weak restrictions allowing the continued use of torture by the biggest culprits after the establishment of a standard prohibiting it. It would be seen as an egregious double standard and there would be outcry. Yet it seems to be acceptable to many in the CCW on the assumption that weak restrictions capturing non-CCM likely candidates is better than nothing. I'm not convinced of that: those countries would be better (as the Cluster Munition Coalition has argued) to take national level actions until such time as they're in a position to join the CCM. Meanwhile, in side meetings and lunchtime events, the members of the CCM along with international organisations and NGOs such as the CMC have been getting on with the task of figuring out how to bring the treaty into force as soon as possible and position the new regime for implementation. I would be very surprised if the CCW Chair - despite his patient, best efforts, which are to be commended - is in a position to present a protocol package tomorrow that can command agreement among the CCW's membership, which operates on a consensus practice. The question remains whether, then, use will be made of the CCW GGE's optional four days of further talks after Easter from 14 to 17 April. Borrie's third law of CCW diplomacy (itself derived from the kinetic theory of gases, naturally) states that the CCW process will expand to fill the available time. In this way, it will be compelled to award itself its short week in April, just as this session was awarded by the CCW despite its undertaking to "negotiate a proposal" by the end of 2008. 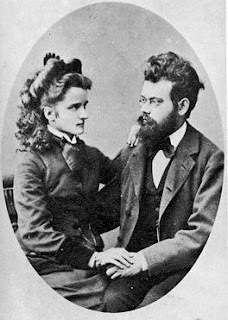 Image of the 19th century Austrian physicist Ludwig Boltzmann (who developed a kinetic theory of gases), aged 31 with his wife, Henrietta, courtesy of Wikipedia Commons.